Thanks for having us again, Jett! It’s always great talking with you about games and life in general. It’s crazy to think that this game brought us together just last year. I feel like we’ve known you for so much longer! Thanks as always for having us again. Ninja Turtles is such a love of ours and it’s funny how it brought us together! Definitely! It’s amazing the things that can come out a shared experience, even if it’s one that may not be so great in itself. The last few months have been a whirlwind for us since we made this connection, and you two might be my favourite siblings since the Ninja Turtles (don’t tell Mat and Jon I said that). But before we get there, let’s talk about this Ninja Turtles game! Where did your story with it? Oh, goodness…I forget exactly how I got into the Ninja Turtles franchise, although it probably had something to do with Uncle Ricky, who got me into video games and comics in the first place. I remember that the 80s Ninja Turtles cartoon was what used to get me up on Saturday mornings, along with Disney’s Aladdin. I don’t remember too many of those 80s episodes, truth be told, but I remember enjoying them enough to be excited about the 2003 Teenage Mutant Ninja Turtles cartoon. 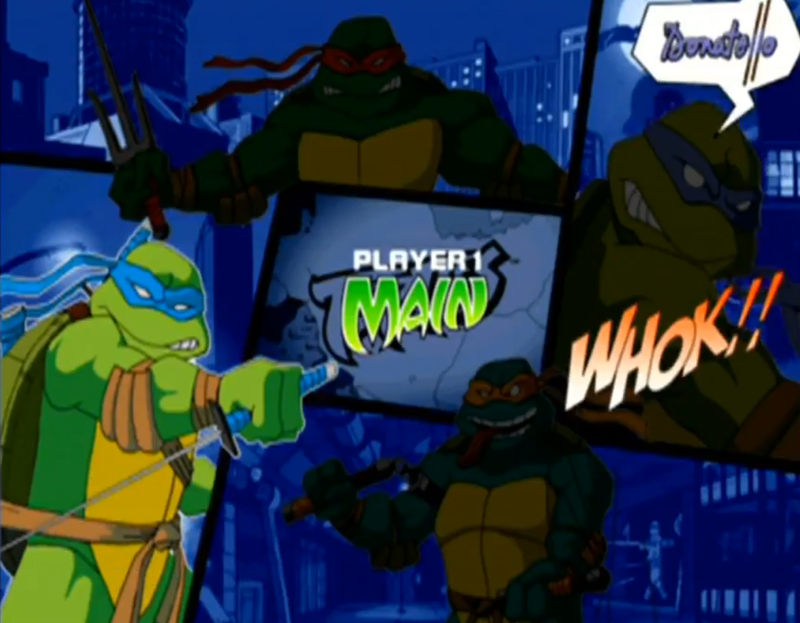 The 2K3 cartoon is probably my favorite version of the famous TMNT. This is going to sound extremely boring, but I don’t really remember either. I used to watch the old cartoons with Kristen on Saturday mornings and we played Turtles in Time together. When this game came out for the GameCube, we probably just had to have it. Turtles in Time is fantastic! It’s easily my favourite Ninja Turtles game. But not long after that game, I kind of grew out of the Ninja Turtles and stopped playing any of the games that came after, including this GameCube Ninja Turtles game. What do you remember about playing it at the time? “BATTER UP!” Honestly, what I remember most about the GameCube Ninja Turtles game is the constant “catchphrases” that the turtles throw out as you button mash to defeat all of the on-screen enemies. 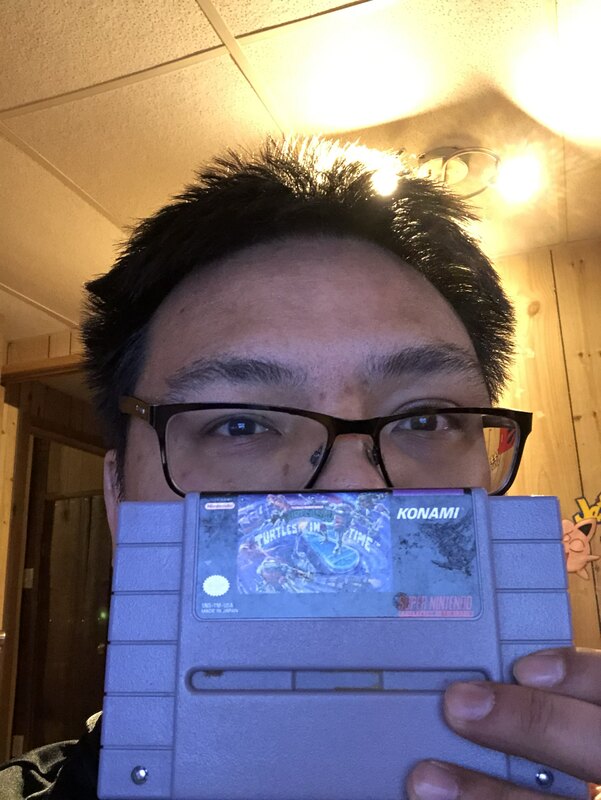 Turtles in Time was definitely done better and should have been included on the SNES Classic console, in my opinion. As Rachel said, though, we saw the Ninja Turtles game for GameCube and we were fans enough to want the game. We even have the second GameCube Ninja Turtles game, despite how awful the first one was. With that said, although the game may be awful, Rachel and I did have a good time playing together. I remember playing the game with Kris and my friend at the time and… never beating it. That game was so easy but it was so hard. The catchphrases, yeah, will never get out of my head, but those levels from the Notes from the Underground episodes? I don’t think I’ll ever get over those. We could also get past the first boss but never the second. If we did, we had lost so many lives that we’d lose to the third boss and then have to start all over again. So, I guess another thing I remember most is the crappy save mechanic of the game. I can’t speak to the game’s save mechanics, because I never played the full game. But I totally hear you (and Leonardo) on the catchphrase criticism. I stumbled across a demo of the game during a live stream and OH MY GOSH PLEASE STOP IT WITH THE CATCHPHRASES! It seemed like the game only had three-or-four catchphrases per character. Within the first minute of playing the demo, you’ve already heard them all, and by the time I completed it roughly 15 minutes later, they were permanently burned into my brain. Maybe it would have helped if the game were better, but it was a bare-bones experience where there was nothing to it other than walking forward and mashing the attack button until everyone fell over. 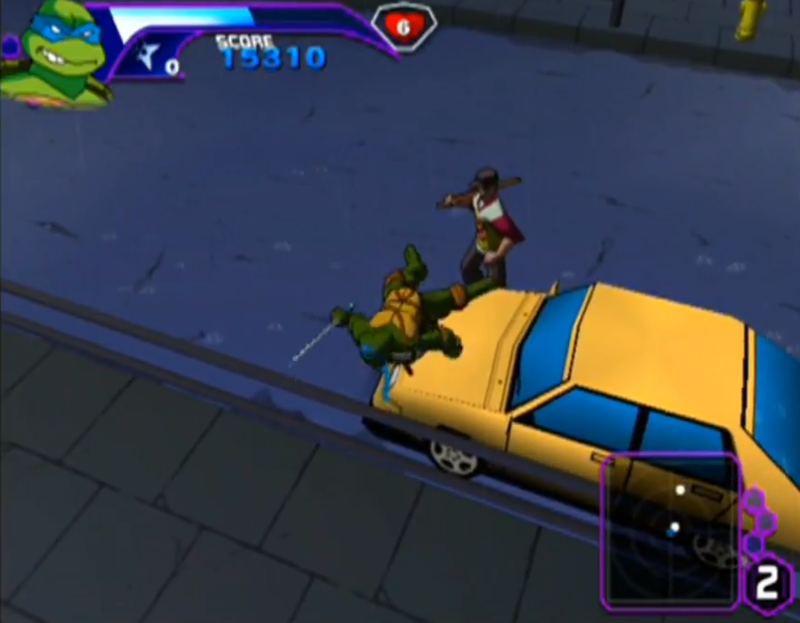 Even Turtles in Time had cool set-pieces and effects, such as throwing enemies at the screen. This demo was just the Ninja Turtles beating up Foot Soldiers on the street. I think I remember it so well because I used to play this with an old friend of mine too, not just Kris. But hey, saving aside, it was fun to play with others. It was a great multiplayer game. I can’t imagine playing it by myself, Jett, even if you did just have the demo. I’m glad we were able to connect through the game as well. And who knows, if we ever meet in real life, we could totally try to do a 3-player run of the game. That is the dream. One day, whether it’s at the Double Jump mansion, or my house, or somewhere else in the universe, we need to beat this game as a team. If the day comes where we get to meet in person, I’m sure this will be high on our to-do list. Do you think that our combined forces have what it takes to beat this game once and for all? I think we can beat it… As long as we’re wearing ear plugs. I don’t think the game’s difficulty will make us quit, but those catchphrases just might. But, hey, if we can’t beat this game, there’s always the sequel and then the Wii’s TMNT Smash-Up. That’d be interesting one to play with each other, I think, haha! It’s like Super Smash Brothers but with Ninja Turtle characters! We can totally beat the game! This game has had it coming! Until the day comes when we can kick this Ninja Turtles game in the teeth, it’s time for it to return to the sewers. Thank you Kris and Rachel for joining me for this! It was a story that was literally years in the making! And maybe one day, as team Triple Jump, we will write the final chapter by beating the game and watching the end credits roll together. Hopefully there will be some post-game content for Triple Jump after those credits roll, though! Thanks again for having us on here, it’s been fun, as always. Thanks again for hosting us. It’s always fun. In the meantime, here’s to playing more games together through the Internet! Hope you have an answer for my Snorlax when we finally clash in Pokemon Let’s Go Pikachu and Let’s Go Eevee! And hopefully I remember to watch the back of my head if Kris is standing behind me! Once again, thanks to Kris and Rachel for their help on this, as I couldn’t have done this story justice without them. 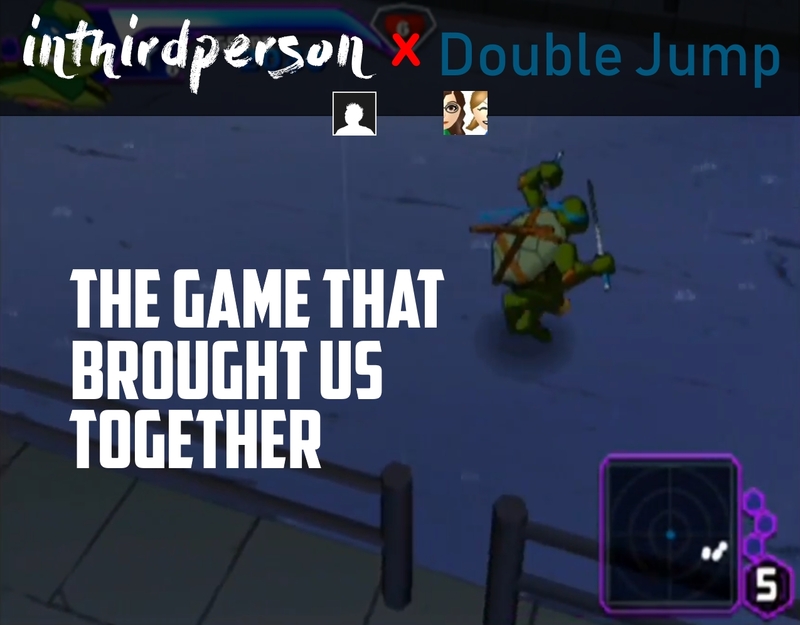 Make sure you check out our other post on doublexjump.com where reflect on how positive of an experience this Triple Jump team-up has been for us all. Even when we’re not collaborating, make sure to follow all of the great work across the web!